Cheryl Alters Jamison makes some classic fall recipes from our September issue on the New Mexico Style show. Once you get home with a fragrant, just-picked haul of the best fruits and vegetables, move right into cooking mode. These recipes promise the maximum deliciousness with the minimum effort and fuss. After eating our fill of real garden tomatoes over the sink, in BLTs, and in caprese salads, it comes time to think about other ways to prepare them. Preheat oven to 400° F. Cover baking sheet with Silpat (silicon) sheet, foil, or parchment, for easy cleaning. Halve tomatoes; squeeze out seeds and excess liquid. Arrange tomatoes, cut side down, on baking sheet in single layer, and spray tomato skins lightly with oil. Roast 25 minutes, then pour off any liquid that has accumulated on sheet. Spritz onion, carrot, and celery pieces with oil and tuck in around tomatoes. Return sheet to oven and roast another 15 to 20 minutes, until tomatoes are very soft, with dark skins, and vegetable chunks are soft with a bit of color. Set aside to cool. Pull skins off tomatoes and discard skins (most should come off easily). Purée tomatoes, vegetable chunks, red wine vinegar, and red chile in batches, preferably in blender or food processor. If mixture is too dry to purée easily, add some of the stock. Combine tomato mixture and stock in saucepan and heat through. Add salt and pepper to taste. Spoon into bowls and top each bowl with drizzle of olive oil. Garnish with diced tomatoes, scallion tops, cilantro, or a combination, if you wish, and serve. Adapted from The Border Cookbook © 1995 by Cheryl Alters Jamison and Bill Jamison. 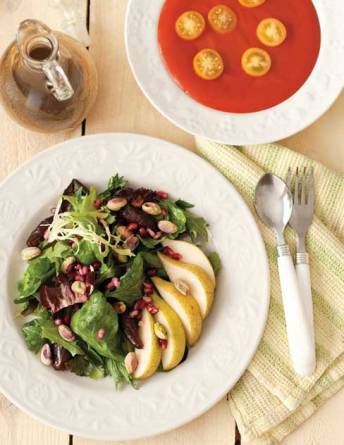 Mix together some late-season New Mexico fruit and greens with a tangy dressing featuring local honey. Add goat-cheese crumbles to make it more of an entrée salad. Prepare vinaigrette by combining all ingredients in blender. Reserve. Cut pomegranate in quarters. In bowl of water deep enough to cover your hands and pomegranate wedges, pop out seeds. Pour off water and membranes, then lightly drain seeds on paper towel. Toss greens with vinaigrette in large bowl, then arrange on individual plates. Divide fig halves and pear wedges among the six salads. Scatter each with pomegranate seeds and pistachios, and serve. I find few dessert treats easier to put together than fruit crisps. With an apple version, you do have to peel and slice the fruit, but it’s still pretty hassle-free. Preheat oven to 375 F. Butter 8- or 9-inch baking dish. Peel, core, and slice apples into small chunks. Pile in prepared dish, mixing with 2 teaspoons of flour. Combine remaining flour, brown sugar, pecans, cinnamon, and salt in food processor and pulse to combine. Add butter and pulse until mixture becomes a crumbly meal. Spoon topping evenly over apples, lightly packing it down. Bake crisp about 30 minutes, until topping is crunchy and apples are tender. Serve warm. Adapted from American Home Cooking © 1999, Cheryl Alters Jamison and Bill Jamison.